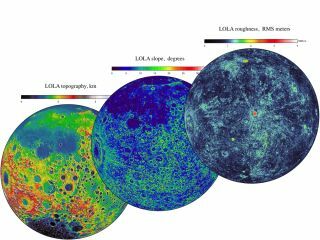 LOLA data from NASA's Lunar Reconnaissance Orbiter shows three complementary views of the near side of the moon: the topography (left) along with new maps of the surface slope values (middle) and the roughness of the topography (right). All three views are centered on the relatively young impact crater Tycho, with the Orientale basin on the left side. Scientists have pieced together the most accurate and detailed map of the entire moon in history, using photos snapped by NASA's Lunar Reconnaissance Orbiter (LRO). The global lunar map — which was unveiled in March with the latest flood of other LRO moon photos — is a mosaic stitched together from thousands of pictures taken by the Lunar Reconnaissance Orbiter Camera (LROC). The map provides an unprecedented look at the moon from pole to pole, and should be a valuable resource for future lunar research and exploration plans, scientists said. The new moon map was created using more than 15,000 photos taken between November 2009 and February 2011 by the Wide Angle Camera, one of LROC's three instruments, NASA officials said. The photos were taken when the sun was relatively close to the lunar horizon — a good position for bringing out details of lunar surface topography. The new global view has a resolution of 328 feet (100 meters) per pixel, with an accuracy to match, researchers said — meaning the position of individual features on the moon can be determined confidently to within about 328 feet. For both of these reasons, the new map is an improvement over previous whole-moon images. NASA's five Lunar Orbiter missions in 1966 and 1967 — which mapped the lunar surface in preparation for the Apollo landings — delivered lower resolution on the moon's far side and were accurate to within a mile or two (2 to 3 kilometers), Robinson said. In the 1990s, NASA's Clementine spacecraft delivered resolution of about 328 to 656 feet per pixel (100 to 200 m) across the lunar surface — but its accuracy also couldn't compare to that of LRO, according to Robinson. The $504 million LRO probe launched in June 2009 along with a piggyback spacecraft called LCROSS. LCROSS crashed into a shadowed crater at the moon's south pole in October 2009 in a hunt for water ice, which it found. LRO is about the size of a Mini Cooper car, and it's equipped with seven instruments to observe the moon. The spacecraft circles the moon in a polar orbit, at an altitude of about 31 miles (50 km). For the first year of its operational life, LRO scouted the moon to help NASA plan for future lunar exploration missions. In September 2010, the probe wrapped up this mission and shifted into a pure science mode, to help scientists better understand Earth's nearest neighbor. Even before the latest release, LRO had come through in a big way. The probe helped confirm LCROSS' water findings, for example, and observations by LRO's laser altimeter helped researchers generate the most detailed topographic map of the lunar surface ever made. In addition to the Wide Angle Camera, LROC has two Narrow Angle Cameras (NACs), which provide images at resolutions between 1.6 and 6.6 feet (0.5 and 2 m) per pixel. The NACs are also systematically photographing the moon, peering especially intently at regions of interest for potential manned lunar exploration missions — such as possible landing sites, and polar regions that may harbor enough water ice to support moon outposts. NASA made public some of these NAC-derived mosaics last month as well. Robinson said he'd love to be able to map the entire lunar surface with the NAC gear, giving scientists a global mosaic with the sky-high resolution of 6.6 feet (2 m) per pixel. He reckons that would take another five or six years to accomplish. "I think that's totally doable," Robinson told SPACE.com. "That would be the ultimate dataset for planning any future exploration of the moon." Whether or not LRO is given the opportunity to finish that job, the spacecraft's many instruments have already made huge contributions to lunar science, according to Robinson. The probe — along with other efforts, such as India's Chandrayaan moon missions — is helping round out and reshape researchers' views of Earth's nearest neighbor. "With all these new datasets coming together, it's a whole new moon," Robinson said. LRO, which is still going strong, is also laying the foundation for possible manned lunar bases, he added. "If we want to explore Mars or other parts of the inner solar system, we have to go to the moon first," Robinson said. "And LRO is providing the data to enable us to go."